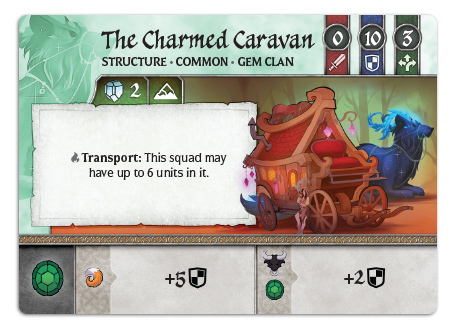 The Charmed Caravan, or as it’s been called in my games, the Party Wagon, allows you to pack up to 5 other Gem units inside of it. Do be careful though, for if the caravan is ever removed from the squad, the squad limit is immediately reapplied, and you will need to discard down to 3 units in the squad. There is a clever way around this. A fun fact about caravans is that you can stack them inside each other. Let’s just say they’re bigger on the inside. This prevents you from having to discard down to 3 units when a caravan is destroyed, plus it comes with the added bonus that you stacked 30 defense on top of your normal three units! As we’ve seen, the Gem Clan grows in strength as crystals are scored. Crystal Gazers grow as well, but they gain power in their own way. Respark allows you to take one of your facedown crystals (in other words, a crystal with a non-immediate power that you’ve used), and flip it back face-up. This may have an influence over which crystals you acquire when you score, as getting to re-use some crystal powers can be particularly advantageous. 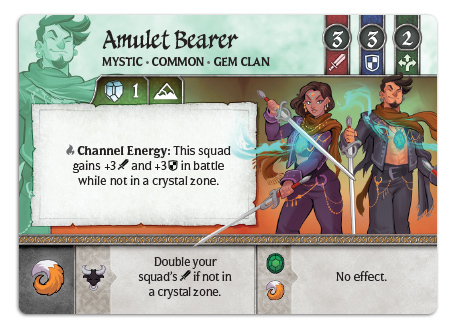 Battles in Crystal Clans frequently take place inside the crystal zones, but if you can force a fight out in the open, Amulet Bearers are a great choice. By Channeling Energy from the nearby crystal zones, they are able to strengthen their squad while also boosting their defenses. Amulet Bearers are especially strong in the oft-contested home zones, both to eliminate invading threats as well as going on the offensive. For a clan to rely on scoring crystals as much as Gem Clan, they need some easy ways to score those crystals. That’s the specialist role of the Crystal Seekers. 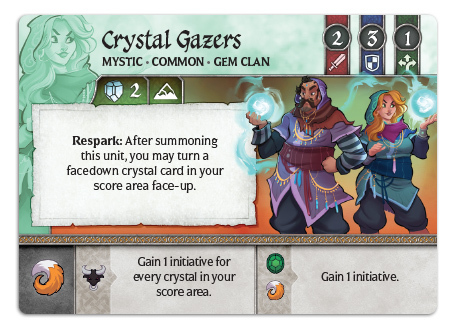 When a Crystal Seeker leads a squad into a crystal zone and then scores the crystal, they can reduce the cost of the crystal by 1 initiative for every mystic unit you control in a crystal zone. 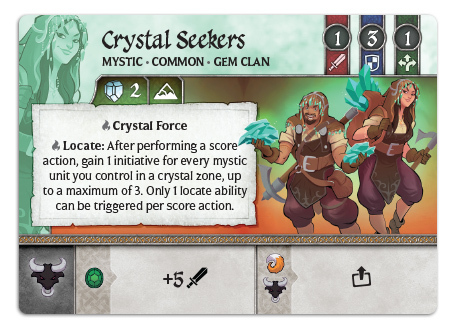 Scoring a crystal for as little as 4 initiative allows the Gem Clan an easy start to build up their Crystal Force. Mala’s ability, Crystal Break, replicates one of the most powerful crystals in the entire game, the Broken Vessel. 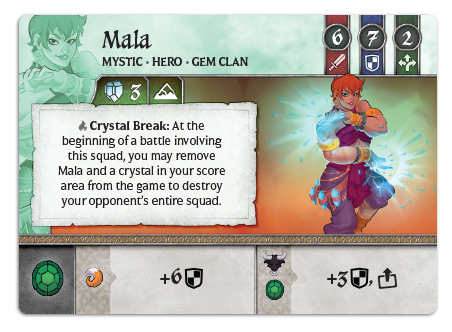 When Mala is in battle, she can choose to explode any crystal in the Gem Clan’s possession to destroy the entire opposing squad. This action should not be taken lightly, as in addition to losing a crystal, Mala must also sacrifice herself, removing her from the game entirely. I hope you enjoyed reading through all of my previews, and thank you all for putting up with my terrible jokes. Also, feel free to share your favorite clan so far in the comments down below. For the record, I’m definitely on team Shadow Clan (although I really like Fang, Fire, Moon, and Blood as well). Both the Gem and Moon Clan are availabe now from retailers and on our own web-store.